The owner of the Dallas Mavericks got caught up in the hype surrounding the Facebook IPO launch a month ago and snapped up 150,000 of the social media giant's shares, but the excitement was short-lived. Today, the gregarious self-made billionaire announced that he sold all of his shares after admitting that he took a hit in the market. Late last month, Cuban disclosed on his blog that he had bought nearly $5million worth of Facebook shares in three separate purchases, the Wall Street Journal reported. He said he purchased 50,000 shares at $33, another 50,000 at $31.97 and 50,000 at $32.50. All three investments are currently underwater. 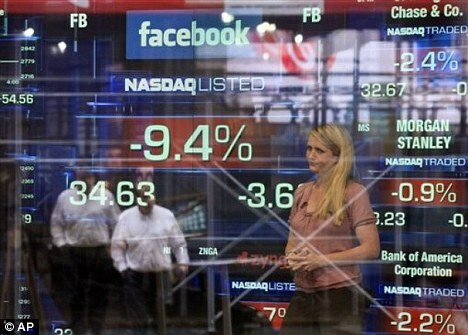 On Tuesday, Facebook was up 4.2 per cent at $31.26, but still down about 18 per cent from its $38 IPO price. It means that at the current price, Cuban lost nearly $200,000 on his investment. At the time of the IPO launch, Cuban described the move as ‘a trade, not an investment’ and compared it to trading baseball cards. 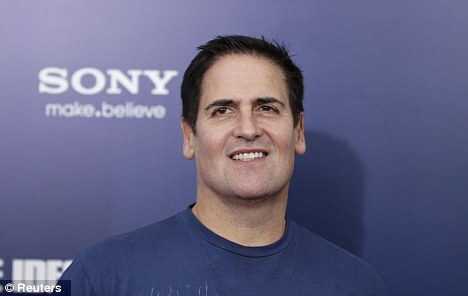 The loss, however, is just a drop in the bucket for the 53-year-Cuban, whose net worth stands at $2.3billion, and who is the 188th richest person in the U.S., according to Forbes. Facebook’s trading debut got off to an inauspicious start after being marred by technical glitches on the Nasdaq Stock Market that delayed the launch by several hours, leaving many investors confused over whether their orders to buy and sell shares had been fulfilled. The stock’s steep decline over its first month of trading left it as the worst-performing IPO of $1billion or more for a U.S.-based company, according to Dealogic. Cuban says much of the decline is due to basic supply and demand issues. Days before pricing the IPO, Facebook boosted the number of shares to 421 million shares, which the Mavericks owner deemed a big mistake. By comparison, the networking site LinkedIn issued only 8.4million shares when it debuted last year. The stock more than doubled during its first day of trading. 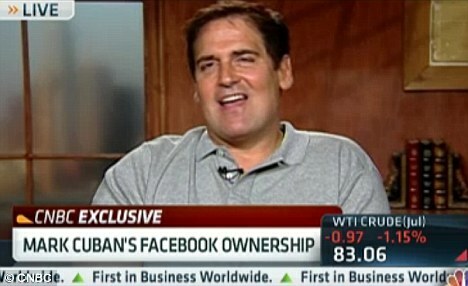 ‘If Facebook did the same, the stock would be at about $200 right now,’ Cuban said. 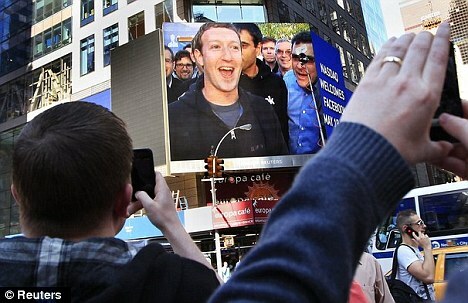 The brainchild of Mark Zuckerberg also faces increased criticism of how it plans to monetize its mobile platform. Cuban, who co-founded and sold start-ups like Broadcast.com and MicroSolutions, acknowledged that the mobile space is huge, but it's an issue every Internet company will have to grapple with. NEW YORK, June 19 (Reuters) - U.S. stocks rallied on Tuesday on hopes that the Federal Reserve's policy meeting will agree on extending stimulus measures as the economy struggles to recover. Growth-related stocks led the rally, with the S&P materials sector up 1.7 percent and the financial sector up 1.5 percent. U.S. Steel Corp jumped 5.4 percent to $19.41 and Bank of America added 4.8 percent to $8.13. The Federal Open Market Committee was to begin the first day of a two-day meeting on interest rate policy, with expectations increasing that the U.S. central bank may extend its "Operation Twist" program, its effort to drive down long-term borrowing costs. "Lower Spanish yields have calmed world markets and optimism over some type of stimulus from the Fed tomorrow is sparking strong buying today," said Ryan Detrick, senior technical strategist at Schaeffer's Investment Research in Cincinnati. The Dow Jones industrial average rose 109.32 points, or 0.86 percent, to 12,851.18. The S&P 500 Index gained 12.62 points, or 0.94 percent, to 1,357.40. The Nasdaq Composite added 31.83 points, or 1.10 percent, to 2,927.16. In Greece, political parties said they expected to form a coalition government soon and then seek concessions to the austerity measures that are both keeping the country away from bankruptcy and mired in a very long recession. Oracle Corp rose 2.8 percent to $27.88 a day after it reported stronger-than-expected quarterly profit, releasing the results three days ahead of schedule after news of the pending departure of a senior sales executive fueled concerns that business was stagnating. Walgreen Co tumbled 6.2 percent to $29.99 after the pharmacy chain reported quarterly earnings and said it would buy a 45 percent stake in Alliance Boots for $6.7 billion in a cash and stock deal. FedEx Corp rose 2.9 percent to $91.80 after the package delivery company reported fourth-quarter earnings and provided an outlook for the first-quarter and 2013. NEW YORK (Reuters) - World stocks and the euro gained on Tuesday as Europe's worsening debt crisis and its impact on global growth encouraged talk of a policy response by the world's major central banks. U.S. Federal Reserve begins on Tuesday a two-day policy-setting meeting with investors focused on whether it will unveil any more stimulus to support the lackluster recovery. Expectations of further stimulus from the Fed pressured the U.S. dollar across the board. U.S. stocks were moderately higher, while world stocks, as measured by the MSCI's all-country world equity index rose 0.6 percent. The euro was last up 0.5 percent on the day at $1.2640 after hitting session highs of $1.2647. "There is positioning ahead of the Fed with the dollar unable to capitalize on euro negative sentiment ahead of the Fed," said Omer Esiner, chief market analyst at Commonwealth Foreign Exchange in Washington. "The risk is relatively high that (Fed) officials will signal the need for more stimulus." On Wall Street, the Dow Jones industrial average was up 68.87 points, or 0.54 percent, at 12,810.69. The Standard & Poor's 500 Index was up 9.67 points, or 0.72 percent, at 1,354.45. The Nasdaq Composite Index was up 25.06 points, or 0.87 percent, at 2,920.39. Gains in riskier asset markets were limited by concerns over a sharp rise in Spain's short-term borrowing costs, a big fall in German investor confidence, and fresh worries about Greece's commitment to its bailout plan. Spain was forced to pay yields of over five percent to sell 12- and 18-month Treasury bills in an auction as investors worried the country will soon have to ask for international aid. It faces a bigger test on Thursday with a sale of longer-term bonds. In the oil market, Brent crude bounced from near a 17-month low. Emerging-market stocks advanced to a five-week high as Federal Reserve officials meet to consider measures to stimulate the world’s biggest economy and as Greece moved toward forming a new government. The MSCI Emerging Markets Index (MXEF) climbed 0.9 percent to 942.16 as of 10:55 a.m. in New York, set for the highest close since May 15. Brazil’s benchmark Bovespa (IBOV) stock index advanced for a third day, led by Fibria Celulose SA (FIBR3), the world’s largest pulp producer, and Petroleo Brasileiro SA (PETR4), Brazil’s state- controlled oil company. OAO GMK Norilsk Nickel was headed for a two-month high as the Micex Index gained 0.2 percent. The Hang Seng China Enterprises Index of Chinese companies listed in Hong Kong retreated 0.2 percent as Tsingtao Brewery Co. (168) tumbled 7.8 percent, the most in two years. Fed policy makers begin a two-day meeting today to discuss U.S. growth and consider lengthening the maturity of its Treasury holdings. Greek politicians continued talks to form a government after the June 17 elections while Evangelos Venizelos, head of the Pasok party, said the country should renegotiate its international rescue deal. Spain will delay publishing an audit of banks’ balance sheets until September, according to a person familiar with official plans. The 21 countries in the MSCI emerging market index send about 30 percent of their exports to the European Union on average, data compiled by the World Trade Organization show. “As in the past, the Fed is expected to make an advance move and deliver quantitative easing,” Societe Generale SA analysts, led by Alain Bokobza in Paris, wrote in an e-mailed report today. More leaders attending a Group of 20 summit in Los Cabos, Mexico agreed to provide contributions to the International Monetary Fund to help it protect the global economy from the effects of Europe’s debt crisis, IMF Managing Director Christine Lagarde said in a statement on the sidelines of the two-day summit. China said it would contribute $43 billion to the fund, while Mexico would contribute $10 billion, matching pledge amounts made by Russia, India and Brazil. Russia relies on the economic bloc for about 52 percent of its foreign shipments, while China sends about 20 percent of its overseas sales to the EU, according to the WTO. Emerging-market stocks are in a “sweet spot” as economic growth remains buoyant in China and valuations plunge from historical averages, Mark Mobius, who oversees about $50 billion as executive chairman of Templeton Emerging Markets Group, said in an interview from Singapore today. He’s adding to equities in China, Russia, Turkey, Thailand and Africa. New York-based index provider MSCI Inc. will release the results of its classification review tomorrow. The United Arab Emirates and Qatar are up for a potential upgrade to emerging- market status while South Korea and Taiwan are being considered for a promotion to developed-market status. MSCI, whose stock indexes are tracked by investors with about $7 trillion in assets, will make the announcement at 10 p.m. London time. Fibria Celulose jumped 4.8 percent, the most in five weeks, while Petrobras added 4 percent, its fifth advance in six days. Retailer Lojas Americanas SA (LAME4), Brazil’s second-largest retailer by market value, rose 1.6 percent. Egypt’s benchmark EGX30 Index (EGX30) lost 4.2 percent, the most among 95 global indexes tracked by Bloomberg, after the country’s generals said in a statement yesterday that authority would shift to the newly elected head of state by the end of this month. The previous night, they issued a decree curtailing presidential powers and expanding their own. The ISE National 100 Index (XU100) gained 1.7 percent in Istanbul, after a 0.2 percent decline yesterday ended its longest winning streak since 1993. The WIG20 Index (WIG20) gained 1.6 percent in Warsaw. OAO RusHydro fell 5.4 percent in Moscow after Kommersant reported that Russia’s largest hydropower company may hold a secondary public share sale. CarrefourSA Carrefour Sabanci Ticaret Merkezi AS (CARFA) gained 4.3 percent in Istanbul after part-owner Haci Omer Sabanci Holding AS, Turkey’s second-biggest group of companies, said it continues to assess buying shares in the unit from parent Carrefour SA. The rupee weakened 0.1 percent. Fitch Ratings cut its outlook on India’s sovereign credit rating to negative from stable after stock markets closed yesterday. Tsingtao plunged the most in two years in Hong Kong after Chinese billionaire Chen Fashu sold 32 million Hong Kong-listed shares of the beer maker at a discount. Sri Lanka’s benchmark Colombo All-Share Index (CSEALL) rose 1.2 percent after gross domestic product topped forecasts. The BSE India Sensitive Index (SENSEX) advanced 0.9 percent. ITC Ltd., India’s biggest tobacco company, jumped 2.5 percent on speculation earnings will be sheltered from slowing growth. HTC Corp. (2498), Asia’s second-largest smartphone maker, climbed 3.9 percent in Taipei, the most since May 29. It signed agreements with China’s Sina Corp. and Tencent Holdings Ltd. (700) to collaborate on Chinese mobile Internet services, HTC said in an e-mailed statement to Bloomberg News today. The extra yield investors demand to own emerging-market debt over U.S. Treasuries slid three basis points, or 3.83 percentage point, to 383 basis points, according to JPMorgan Chase & Co.’s EMBI Global Index. Global stocks rose for a fourth day, the longest rally since April, and the U.S. dollar weakened as investors speculated the Federal Reserve may announce more stimulus measures. The euro climbed as Spanish bond yields fell after the government met its target at a bill auction. The MSCI All-Country World Index added 1.3 percent at 11:37 a.m. in New York and the Standard & Poor’s 500 Index (SPX) climbed 1.1 percent to 1,358,91, its highest level in more than a month. The dollar depreciated versus 15 of 16 major peers, with the euro strengthening 0.9 percent to $1.2694. The yield on Spain’s ten- year note dropped 12 basis points to 7.04 percent, retreating from a euro-era record. Corn and soybeans led gains in commodities as crop conditions deteriorated in the U.S. Midwest because of hot, dry weather. Oil rallied 1 percent. Signs of faltering growth with inflation below a 2 percent target mean the Fed will announce new steps to boost the economy as soon as this week’s meeting, according to 12 of the 21 primary dealers who trade with the central bank. Group of 20 leaders were focusing their response to Europe’s financial crisis at a summit in Mexico as Greece’s creditors appeared set to ease bailout terms following elections. Shares of commodity producers, financial firms and industrial companies rose more than 1 percent to lead gains in nine of the 10 main groups in the S&P 500 today. Nvidia Corp. rallied 6.8 percent for the biggest advance in the S&P 500 after Microsoft Corp. said its Surface tablet computer will be powered by the company’s Tegra processor. Microsoft jumped 3.8 percent, while Apple Inc., maker of the iPad tablet, was little changed. Oracle Corp., the world’s largest maker of database software, rose 2.6 percent after fiscal fourth-quarter profit topped analysts’ estimates, buoyed by sales of new software licenses. The S&P 500 plunged 9.9 percent from a four-year high on April 2 through June 1 amid signs economic growth was slowing as Europe struggled to contain its debt crisis. It has rebounded more than 6 percent since then after the slump dragged the gauge’s valuation to 12.9 times companies’ reported earnings, the cheapest level since November, and investors speculated global policy makers will take additional steps to spur growth. The Fed is scheduled to release its statement on interest rates and the economy tomorrow at 12:30 p.m. in Washington. The central bank kept the economy growing for nine-straight quarters by pumping $2.3 trillion into the financial system starting in November 2008 and shifting $400 billion into longer-term debt. “There is no doubt the economy stinks but the Fed is quite clearly unsure, correctly or not, that it has the tools to affect outcomes in a sustainable manner,” Dan Greenhaus, chief global strategist at BTIG LLC in New York, said in a note to clients. The Dollar Index, a gauge of the U.S. currency against six major peers, dropped 0.7 percent. The currencies of Brazil, Norway and Mexico led gains against the U.S. dollar, strengthening at least 1 percent. The S&P GSCI Index of commodities rallied 0.9 percent. Corn, soybeans, coffee, cotton and wheat surged at least 2.6 percent to lead gains in 16 of 24 materials tracked by the index. Hot, dry weather in the next three days will increase stress on about a third of the Midwest crop, Commodity Weather Group LLC said in a report. Almost 10 shares advanced for every one that declined in the Stoxx Europe 600 Index (SXXP), sending the gauge up 1.6 percent to its highest level in more than a month. Home Retail Group Plc surged 24 percent as sales at the Argos chain beat estimates. Whitbread Plc jumped 6.4 percent as first-quarter revenue increased. SAP AG rose 2.1 percent after Oracle’s results. Danone tumbled 6 percent after the world’s biggest yogurt maker cut its profitability forecast. The cost of insuring Spanish sovereign debt fell from an all-time high as the nation sold 3.04 billion euros ($3.8 billion) of bills, compared with a target of 3 billion euros. Credit-default swaps on Spain fell 14 basis points to 607. The yield premium investors demand to own Spanish debt over benchmark German bunds narrowed 20 basis points to 555 basis points. Spain’s government sold 2.4 billion euros of 12-month bills at an average rate of 5.074 percent, up from 2.985 percent paid on May 14. It also sold 639.3 million euros of 18-month debt at 5.107 percent, compared with 3.302 percent last month, the Madrid-based Bank of Spain said today. The Italian 10-year bond yield fell 17 basis points to 5.92 percent. The Helsinki 25 Index of Finland’s most-traded stocks rallied 1.3 percent and the nation’s 10-year bond yield rose 12 basis points to 1.91 percent. Finland raised its forecast for economic growth as private consumption is expected to offset slowing exports. Gross domestic product will expand 1 percent this year, 1.2 percent in 2013, and 2.1 percent in 2014, the Finance Ministry said. It had predicted growth of 0.8 percent for this year in an April forecast. Volatility in Finnish bonds was the highest in developed markets, according to measures of 10-year debt, the two-year and 10-year yield spread and credit-default swaps. Rates on 10-year German bunds, which reached a record low of 1.127 percent on June 1, climbed 12 basis points to 1.53 percent today. Denmark sold 1.55 billion kroner ($262 million) of a 2 percent note due 2014 to yield minus 0.08 percent today, according to the central bank, the first time it has auctioned the debt at a negative yield. The euro gained against 11 of its 16 major counterparts, strengthening 0.7 percent versus the yen. The MSCI Emerging Markets Index climbed 1 percent, gaining for a third day. India’s Sensex advanced 0.9 percent. Egypt’s EGX 30 Index tumbled 4.2 percent to the lowest level since January as a power struggle between civilian politicians and the ruling generals threatened to derail the country’s transition to democracy. NEW YORK, June 19 (Reuters) - U.S. stocks advanced on Tuesday, putting the S&P 500 on track for its fourth straight gain on increased hopes for central bank stimulus measures ahead of the Federal Reserve's policy meeting. The Federal Open Market Committee begins the first day of a two-day meeting on interest rate policy, with expectations increasing that the U.S. central bank may extend its "Operation Twist" program, its effort to drive down long-term borrowing costs. "It's a little bit of anticipation ahead of the Fed meeting," said Fred Dickson, chief market strategist at D.A. Davidson & Co of Lake Oswego, Oregon. "To look at it, I would say 90 percent of it is Fed action, a little bit is maybe progress in Greece toward forming their government and a successful Spanish auction but at high yields." Spain's short-term borrowing costs rose to their highest level since 1997 after it raised 3 billion euros at a short-term debt sale, and yields on its 10-year bond remained above the troublesome 7 percent mark, which has resulted in a bailout for other countries. In Greece, political leaders raced to build a coalition government led by conservative New Democracy leader Antonis Samaras, that would seek to renegotiate the terms of Greece's 130 billion euro EU/IMF bailout agreement. The PHLX Europe sector index gained 1.5 percent. The Dow Jones industrial average gained 72.01 points, or 0.57 percent, to 12,813.83. The Standard & Poor's 500 Index rose 7.80 points, or 0.58 percent, to 1,352.58. The Nasdaq Composite Index climbed 16.68 points, or 0.58 percent, to 2,912.01. Oracle Corp rose 5.1 percent to $28.51 as the top boost to the Nasdaq 100 index after it reported stronger-than-expected quarterly profit after the bell on Monday, releasing the results three days ahead of schedule after news of the pending departure of a senior sales executive fueled concerns that business was stagnating. Walgreen Co tumbled 4.9 percent to $30.39 as the biggest drag on the benchmark S&P 500 index after the pharmacy chain reported quarterly earnings and said it would buy a 45 percent stake in KKR & Co -backed Alliance Boots for $6.7 billion in a cash and stock deal. FedEx Corp added 0.6 percent to $89 after the package delivery company reported fourth-quarter earnings and provided an outlook for the first-quarter and 2013. World stocks and the euro rose on Tuesday amid hopes of more stimulus measures from the US Federal Reserve and despite strains on Spain and poor investor sentiment in Germany. At around 1500 GMT, European and US equities shrugged aside Asian indices that mostly closed lower as the leaders of the world's major economies embarked on the final day of the G20 summit determined to kickstart world growth. The gains followed a successful Spanish bond auction and was fueled by hopes that the US Federal Reserve would move to boost the world economy during two days of meetings that began Tuesday. But traders were still betting on Greece exiting the European single currency region despite weekend elections which saw Greece's two main pro-austerity parties win enough votes to form a government. In a further blow to the eurozone, a survey revealed that German investor confidence plummeted in June, sustaining its steepest fall in nearly 14 years on growing concerns about Spain's banking system. Spain succeeded in raising 3.04 billion euros ($3.8 billion) in a short-term debt sale on Tuesday but its borrowing costs soared. "The eurozone crisis is entering a dangerous and existential phase with the rise in Spanish bond yields pointing to the need for a (Spanish) bailout while in Greece, the political situation looks fragile and not strong enough to diminish the scenario of a Greek exit," said Neil MacKinnon, an analyst at VTB Capital financial group. In afternoon trade, London's FTSE 100 (Euronext: VFTSE.NX - news) index of leading companies climbed 1.88 percent to 5,594.33 points after official data revealed a drop in British annual inflation. Frankfurt's DAX 30 (Xetra: ^GDAXI - news) climbed 1.66 percent to 6,351.95 points and in Paris the CAC 40 (Paris: ^FCHI - news) gained 1.02 percent to 3,097.72 points. Madrid's IBEX 35 (Madrid: IBEX.MC - news) jumped 2.61 percent and Milan's FTSE MIB (Milan: FTSEMIB.MI - news) soared 3.08 percent, compensating for heavy losses on Monday. In the US, the Dow Jones Industrial Average rose 0.63 percent within the first hour of trade, while the S&P 500 (SNP: ^GSPC - news) was up 0.96 percent and the Nasdaq (Nasdaq: ^NDX - news) was up 1.10 percent. In Asia, Tokyo's stock market closed down 0.75 percent, Sydney shed 0.33 percent and Hong Kong ended the day unchanged. Meanwhile, a financial source said that a detailed audit of Spain's stricken banks, which is to follow a first examination due by Thursday, had been delayed to September from late July. It is the second of two audits ordered for the banks, many of which are struggling with balance sheets heavily exposed to a property bubble that collapsed in 2008. Spain's government won agreement on June 9 for its eurozone partners to extend a rescue loan of up to 100 billion euros to salvage the crisis-hit banks. In foreign exchange deals, the euro edged up to $1.2664 from $1.2571 late on Monday in New York (Frankfurt: A0DKRK - news) . The single currency had surged above $1.27 at the start of the week. Sunday's elections put Greece's conservative New Democracy party in the lead, with enough seats to form a ruling coalition committed to austerity measures set out in the nation's 130-billion-euro ($165 billion) EU-IMF (Berlin: MXG1.BE - news) bailout. A euro rally on Monday faded as traders' attention moved to deepening troubles in Spain, where the yields on benchmark 10-year bonds rocketed to a euro-era record of more than 7.2 percent. Anything over 7.0 percent is considered unsustainable and is the point above which Ireland (Xetra: A0Q8L3 - news) , Portugal and Greece were forced into asking for their rescue packages. Madrid is struggling with a banking crisis in addition to a miserable financial situation with soaring unemployment and a huge fiscal deficit. Adding to the gloom, a report from Spain's central bank said bad debts in the country hit their highest level for 18 years in April, sparking concerns that the bailout for its banks might not be enough. "The recent further rise in Spanish government bond yields underlines the fact that the banking bailout will not address the country's broader fiscal problems," analysts from Capital Economics said in a note. "A sovereign bail-out is all but inevitable," they concluded. World stocks were mixed and the euro struggled higher versus the dollar despite growing strains on Spain on top of worries for Greece's eurozone future. European equities rose in morning deals after Asian indices mostly closed lower as the leaders of the world's major economies embarked on the final day of the G20 summit determined to kickstart growth and the eurozone crisis. Analysts were still betting on Greece exiting the European single currency despite weekend elections which saw Greece's two main pro-austerity parties win enough votes to form a government. In a further blow to the eurozone, a survey revealed that German investor confidence plummeted in June, sustaining its steepest fall in nearly 14 years, on increased concerns over the health of Spain's banking system. Spain on Tuesday succeeded in raising 3.04 billion euros ($3.8 billion) in a short-term debt sale but its borrowing costs soared as the eurozone debt storm battered Madrid. In late morning trade, London's FTSE 100 (Euronext: VFTSE.NX - news) index of leading companies climbed 0.83 percent to 5,536.64 points, after official data revealed a drop in British annual inflation. Frankfurt's DAX 30 (Xetra: ^GDAXI - news) climbed 0.41 percent to 6,274.45 points and in Paris the CAC 40 (Paris: ^FCHI - news) eked out a gain of 0.08 percent to 3,067.56. Madrid's IBEX 35 (Madrid: IBEX.MC - news) jumped 1.27 percent. A financial source on Tuesday said that a detailed audit of Spain's stricken banks, which is to follow a first examination due by Thursday, had been delayed to September from late July. It is the second of two audits ordered for the banks, many of them struggling with balance sheets heavily exposed to a property bubble that collapsed in 2008. In foreign exchange deals meanwhile, the euro edged up to $1.2588 from $1.2571 late on Monday in New York (Frankfurt: A0DKRK - news) . The single currency had surged above $1.27 at the start of the week. "The initial relief rally in the euro... which greeted the more favourable Greek election outcome is already losing momentum," said Lee Hardman, currency analyst at The Bank of Tokyo-Mitsubishi UFJ in London. "It is clear that the market is becoming increasingly dissatisfied by developments within the eurozone which merely buy time rather than attempting to solve the underlying problems." Monday's euro rally faded also as traders' attention moved to deepening troubles in Spain, where the yields on benchmark 10-year bonds rocketed to a euro-era record above 7.2 percent. Anything over 7.0 percent is considered unsustainable and is the point above which Ireland (Xetra: A0Q8L3 - news) , Portugal and Greece were forced into asking for a rescue package. Madrid's woes come as it struggles to deal with a banking crisis as well as a miserable financial situation with soaring unemployment and a huge fiscal deficit. "Spain's funding issues have taken the limelight yet again. Not to see if they will need assistance but now by how much they will need in assistance," said Andrew Taylor, a market strategist at GFT trading group in Sydney. "The figures of 100 billion euros seem to be well below audited estimates of 300 billion plus. That is a major mismatch in expectations come bailout agreement time," he said in a note to clients. In Asia on Tuesday, Tokyo's stock market closed down 0.75 percent, Sydney shed 0.33 percent and Hong Kong ended flat. Wall Street stocks finished mixed on Monday.